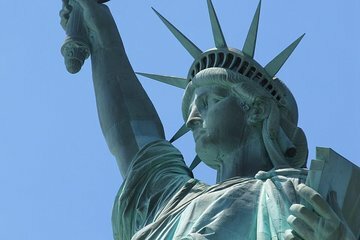 Explore the highlights of New York City with a package that includes a sightseeing bus tour and reserved tickets for the Statue of Liberty ferry. Take the bus tour around the city, then ride the ferry to the Statue of Liberty and Ellis Island. Includes an audio tour at both the Statue of Liberty and Ellis Island, and a meal at Dave and Busters restaurant in Times Square. Make your own way to 45th Street and Broadway to board a climate-controlled bus for The Tour. View all the highlights of the Big Apple through floor-to-ceiling windows that make for a superb sightseeing experience. Then enjoy speedy access to board the ferry to the Statue of Liberty. Travel across New York harbor and disembark at Liberty Island to see the Statue of Liberty up close. Continue to Ellis Island, a key immigration station for the United States where you can learn about the history of immigration in New York. At both Ellis Island and the Statue of Liberty National Monument, audio tours are available (in Arabic, English, French, German, Italian, Japanese, Mandarin, Russian, and Spanish). Your tour includes one lunch or dinner at Dave and Buster's restaurant, which is located in Times Square. Visiting the Statue of Liberty provided excellent oportunities for more photos of the New York skyline. Well worth a visit. This tour was fantastic! Definitley worth it! Loved every inclusion saved the hassle of doing it while you are there, highly recommend! Booking was easy and customer service 5 stars. I will use Viator again for my next vacation. Thanks.